The following are frequently asked questions (FAQ’s) about Hydrodynamics International products, including the shelf-life of our products, general Clonex questions, how to take a plant cutting, and more. Check below for answers to these frequently asked questions. Why has my Clonex Gel liquefied? Clonex Gel can liquefy due to misuse or exposure to extreme temperatures. To ensure your Clonex Gel has a long shelf-life do not dip directly into the bottle or pour leftover product back into the bottle. Also, avoid exposing Clonex Gel to extreme temperatures. You can maximize the shelf-life of Clonex Gel by storing it in the refrigerator when not in use. There are a lot of disclaimers on Clonex Gel. Is it safe to use? The short answer is yes! Clonex Gel is registered with the EPA and is safe for use on all food crops, including medicinal crops. The disclaimers on Clonex Gel are common sense such as do not eat, wash hands after use, etc. How long is Clonex Gel effective once it’s been opened? Clonex Gel is guaranteed for two years if best practices are followed. Best practices include not dipping directly in the Clonex bottle and storing your Clonex in the refrigerator when it’s not in use. The rooting hormone in Clonex is still active if the product is liquefied, but if the gel has turned a grayish color then the hormone is no longer viable. How do I use Clonex gel in an Ez cloner or Turbo cloner? Start your cloning process with the pump deactivated. Dip all your cuttings in Clonex gel as normal. Put the cuttings in the cloner and mist with Clonex mist or water to keep them hydrated. Wait 20 minutes to allow gel the adhere to the tip of the cutting and then turn on the cloner. Spray every other day with Clonex Mist or water. When roots appear, water with Clonex Clone Solution at the normal rate. Replace reservoir water often. Try to keep water temperature around 70*F.
Should I use Clonex Clone Solution during the cloning process? No, Clonex Clone Solution is a fertilizer made specifically for newly rooted seedlings and clones. Use it once roots form. How do I use Clonex Mist? Clonex Mist is a root stimulator that is meant to be sprayed on the leaves of your mother/donor plant and cuttings. We advise spraying the growing tips of the mother/donor plant with Clonex Mist up to a week before taking cuttings. Spray the cuttings with Clonex Mist before placing them into the propagator. Continue to spray the cuttings with Clonex Mist every 2-3 days until the roots are established. Why is white mold on my Root Riot cubes? It may look a little concerning, but white mold occurs naturally in peat and does not affect its efficacy. Temperature fluctuations that simulate seasonal changes may cause it. Do not use Root Riots if you notice any other mold growth other than white. My Root Riot plugs have dried out. Can I re-wet them? Yes, its recommended to saturate then squeeze them to ensure proper moisture. How do I take a plant cutting? Visit our quick overview guide to successful cloning. It helps growers by giving them easy-to-follow directions for successful plant cloning. Why should I use Ionic nutrients over your competitor? Ionic is a single-part nutrient. This means you only need to use one bottle of a Grow, Bloom, or Boost rather than mixing multiple part solutions. Ionic has been on the market since 1997 and is internationally distributed, so you can feel confident that over 16 years of use by growers has ensured the effectiveness of our product. There are white flakes/crystals/something like gravel in my bottle of Ionic. Finding white flakes/crystals/something like gravel is a natural occurrence that can happen over time and is accounted for in the formulation of this product. This occurrence may result when the bottle is exposed to extreme temperatures. Is there a difference between Ionic and Ionic for Soil? These products are similar in terms of mineral concentration, but Ionic for Soil also contains humic acid. Humic acid helps condition soil and provides carbohydrates to microbes. Humic acid can stain or clog hydroponic systems. Why does my Ionic look different from the last one I got. Ionic gets its color from iron. This source material color can change from one batch to the next, resulting in product color variations. Is Ionic a complete fertilizer? Ionic contains all the essential elements needed for healthy plant growth including calcium, magnesium and micronutrients. Where can I buy Hydrodynamics International (HDI) products? Hydroponics and Garden Center retailers that would like to buy our products please contact one of the Distributors listed here. For all other inquiries please see the Store Locator at the bottom of our home page for a store location near you that carries our products. How do I get samples of Hydrodynamics International products? We supply hydroponics stores and garden centers with assorted samples of our products. Please inquire with your hydro store of choice regarding obtaining samples of our products. We also hand out samples at retailer events like Customer Appreciation events. 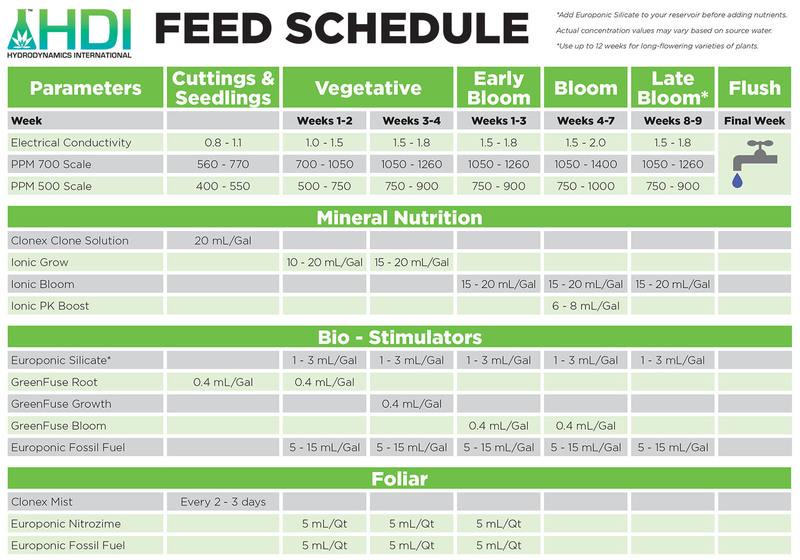 Do you have a feed schedule? Yes, please see our Ionic Feed Schedule. How do I buy your products outside of the U.S.? HDI distributes throughout North America. Customers looking for locations in Canada or Mexico can check our Store Locator found at the bottom of our home page for a retailer in their area that carries our products. For areas outside of North America please check our sister company site, Growth Technology for retail locations carrying our products. How long are HDI products good for? We guarantee all our products for 2 years from the date of manufacture. Return any compromised products that are older than 2 years to the retailer. How do I know when you’ll be in the area? Like us on Facebook or follow us on Twitter. We keep our followers updated on what events we’re attending, what new products we have out, and any other information we think you would be interested in. For further questions, email us at info@hydrodynamicsintl.com.